Pictures of 2003 bicycle trip down USA west coast. 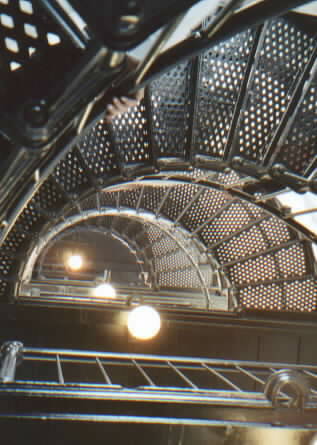 Pictures from my Bicycle tours down West Coast USA Photo on left is a cast iron spiral staircase in an Oregon coast lighthouse. Trips in 1987, 1988, 2003, 2004, 2006 and 2015. Best to bike south as summer wind out of the northwest is at your back. Enjoy hiker/biker sites in Oregon and California state parks. Find my west coast photos and stories on Flickr. Excerpts from letters people sent me about trip in 2003. Follow up from person at visiter center. Thank you for sharing your trip with me. I spent time on your website enjoying the pictures and commentaries. I am glad I took the time to get this information. From all of us at the Oceanside Welcome Center, your biking volunteer, Ana. I just went on the trip vicariously. How enjoyable! Thank you so much for sharing. I like your mix of cultural perspective. It is a diverse journal but one that has strong consistency. I will be sending the link to a friend or two, including the editor of Vancouver's Momentum magazine, who will enjoy reading it. Thanks for sending this. I put the trip in my "Open this when I get a few minutes to enjoy" box. I think we all envy the "freedom to enjoy the land and people" you had (not to mention the wind at your back). Hiya! I'm sorry I didn't write back last month when you first wrote, apres trip, and I very much enjoyed looking at your trip diary. What a nice relaxed way to document the trip. I envy you. Meanwhile I still haven't developed my film (not to mention the one instant camera that got sand in it -- grrr). Thanks for the wonderful photos and commentary. I really felt like I took the trip with you! Also, the commentary on the Yaquina Head Lighthouse was especially timely -- I was just there last Wednesday. My Dad did enjoy that. Would you like to do your trip slide show for the club on February 9? I have set Jim LeGalley up for November 17, and I may have someone for January 19. I'm looking forward to seeing your adventure. Life has changed since my California days. I just looked at another of your pictures, this one looking like a bicycle path through a eucalyptus grove near Monterey. California really is a beautiful place! That picture takes me back to when I lived there. It is a wonderful place. If only there weren't quite so many people so that the cost of living is so prohibitive. But when I was younger, I could afford it because I didn't have any debt, didn't care what kind of neighborhood I lived in, and didn't yet have a "profession." Once you start to have those things, life becomes more complicated and you don't have the same flexibility. I don't necessarily regret the loss. It's a nice time to look back on, but I don't think I'd really want to go back. Or would I? I do think there are always gains and losses as our life changes and we grow in some ways. Thinking of buying a Giant bike. Hey! Thanks for the pictures. I notice you are riding a giant road bike. Do you like it? I have a Cannondale 400 hybrid but we just came back from a bike tour in Cape Cod and I noticed that most people had road bikes. I could see it was much easier on the hills for them then it was for me. So..... I am now thinking of buying another bike. My guy at the store said he is really impressed with the Giants right now. But...... since I know nothing I was not sure what to do. Let me know what your thoughts are since you have done so much more travel then myself. My train to Eugene leaves tomorrow. From there I hope I can connect to a bus and begin the bicycle tour in Florence. Home is Moss Landing. We've had sublime weather and I just hope it holds out a little longer. Fitness advice instead of advise. Your email sent me back to your site where I explored a bit further. Your bike troubles in Baker City (2001 trip) are right out of the recent Ken Burns documentary about Horatio Jackson’s first ever trans-continental car trip. ‘I lie on my sleeping bag in the sun and muse on what a friend said to me before this trip, during a conversation about solo versus team sports. He said that his son would never succeed in America because he had no interest in playing on an organized team. I took offense. My sole team sport, football, ended just as it was beginning, with a compound-fractured arm. The commentary about going alone vs. in group is an excellent summary. Your site will inspire many. Traveled it summer of 53. Thanks for sending me the link; I enjoyed it. The coast is always good salve for itchy feet. I traveled it in summer of 53 (SF - Astoria) and January 78 (San Diego - Bremerton) Also got to explore the Big Sur area during a year at Presidio of Monterrey (DLI) There are redwoods in the canyons just inland from the shore line. The Bixby Creek Bridge is (was?) the world's highest concrete arch bridge. get back on the saddle. Better than a guide book. I really appreciate your perspective. Experience is so hard to earn. I often refered to pages I had photocopied from "Bicycling the Pacific Coast" 3rd Ed., by Kirkendall and Spring (1998). I found a number of discrepancies. Small grocery stores that had closed, others that weren't supposed to exist appeared to have been around for some time. Mileage figures were off, sometimes way off. And there was a general lack of local information that would have been useful, and too much detail that was just clutter. Also, little admonishments like "PLEASE remember hiker biker sites are a privilage and not a right. The fee is modest, so pay it." And "mile 0.2, California fruit inspection. Cooperate, and help protect California agriculture." Yes dad. It made me want to write my own guide. I'm lost in your web right now - awesome bike trip!